The best place to eat in Taxiarchis. With the proper respect to the natural environment, we developed a place in the middle of Taxiarchis Forest in Mount Holomontas in Halkidiki, under the shade of age-long oak and chestnut trees. 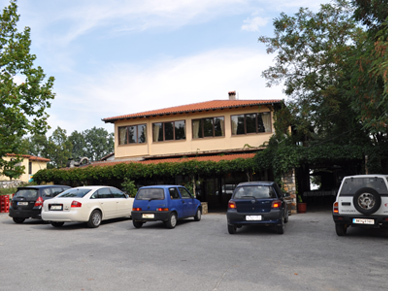 Our tavern offers traditional Greek delicacies and plates, under the succesful management of Jimmys and his three sons, George, John and Mario. Our family and our personel, are always at your service in order to provide everything that is required from you or your company. At the same time we promise to continue the tradition that has establish "Jimmys Restaurant" as your first choice. Our big hall has been renovated recently. We can serve more than 300 persons in comfortable conditions, indoors and outdoors. That makes our restaurantand hostel ideal either for family or group lodging and eating. You can enjoy our dishes sitting on the loft and admiring the wanderfull view outside or sitting near the worm fireplace. Our cuisine... could be easily characterised as a perfect match between taste and flavour. Covering a full range starting from classic platters up to our plat du jour you will always be sure about the quality what you are experiencing. All of our appetizing dishes and salads were made by us with excellent ingredients. Everything is fresh, nothing is standardised. We use only pure olive oil for our salads. The great variety of food will remain unforgettable. Last but not least, the most delicious dish is our meat that you can enjoy it grilled or in the oven. We offer wild pork fresh meat from our own production. Our restaurant can win the trust of every customer that experiences our hospitality and enjoys our ambience, while realising that the skilled management appoints both knowledge and desire on the subject.